Sea, Sand & Sky: Got Lobster? Don't Worry, Southie Does! Whew, this week has been a scorcher! While many people try to stay inside and avoid the heat on days like this, you can depend on the faithful McDonough campers in South Boston to be out and about, ready for new adventures. So whatever happened to those darned lobster traps down at the bottom of Pleasure Bay? Looks like the staffers at McDonough and myself will hopefully be grappling for both of them at some point this week. In the meantime, we set and baited another trap and the water did not disappoint! When my staffers started pulling up the rope to retrieve the trap, the strain on the line was so visible that I knew there had to be something good in there! 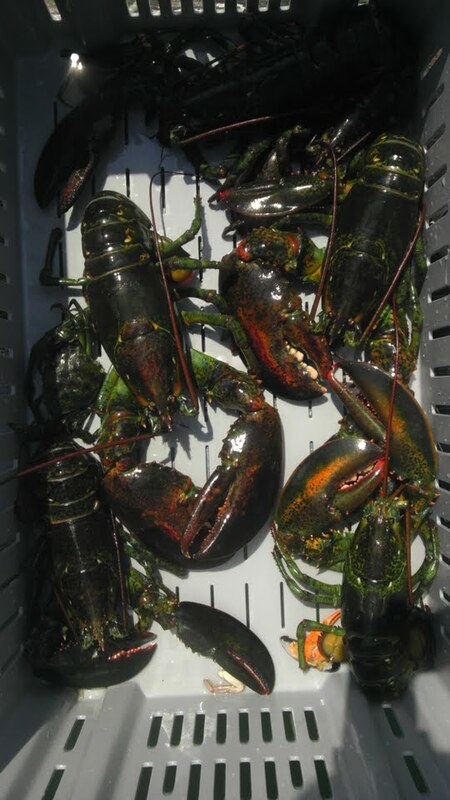 After what seemed like a torturous amount of time spent waiting, the pot was finally pulled up... We brought it back to the dock for the kids and I asked them to count the lobsters that they saw. There ended up being six of them! How many do you see? There are six in there! After spending some time learning about lobster traps (did you know they're also known as apartments?!) and the lobsters themselves, I invited the kids to practice banding the creepy crustaceans. While everyone was enthusiastic, our real star of the day was Anna. 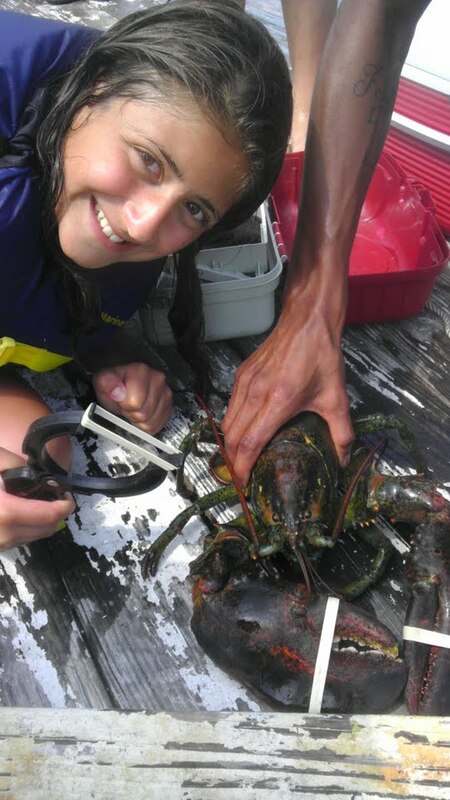 She was first to volunteer for just about everything, and wasn't even afraid to band a few lobsters! Anna helps us band our lobsters. 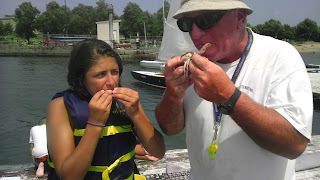 After the hard work banding all of the lobster claws - there were 11 total - Anna took a break and munched on some cooked blue crab (brought from Save the Harbor's office) with the program director, Kenny, aka Coach. 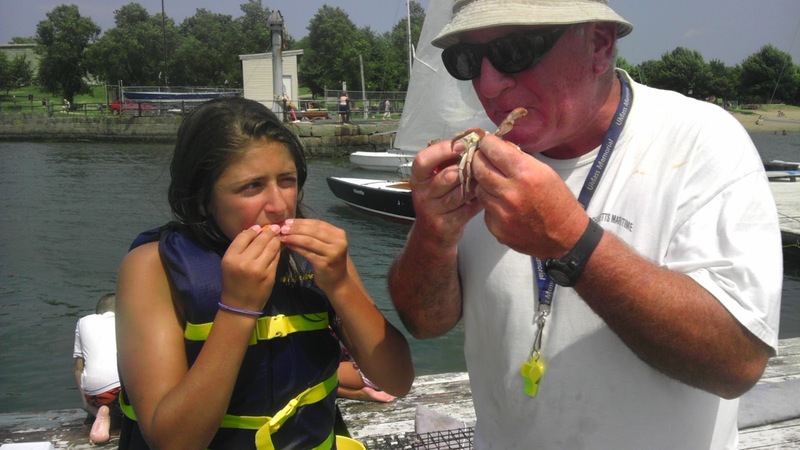 The rest of the crabs were used for bait and seemed to give the kids some big results - they caught over 50 green crabs! Harrison, showing off one of the many green crabs caught that day. Can't wait to see what we've got today!